Sally Weber’s innovative use of holography is a striking reminder that art itself is constantly evolving. 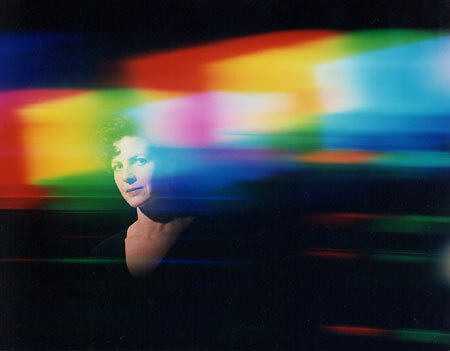 The entire concept of paint, palette and canvas is completely re-evaluated in Weber’s work because light itself is the primary medium the artist uses to create her installations.Weber began producing solar installations in 1982 while doing graduate work at the Massachusetts Institute of Technology’s Center for Advanced Visual Studies. Her work can be found throughout the United States and Europe in architectural and aesthetic applications that specialize in the use of holographic materials to redirect sunlight as color into interior spaces or reflect it off sculptural, exterior works.Ventura’s E.P. Foster Library reopened on November 21, 1999 after $2 million in improvements and renovation, with a new entry artwork by Weber – a light installation called Matrix – commissioned by the City of San Buenaventura Public Art Program. Digital images laminated within glass panels in the library’s entrance evoke the design of integrated circuits in computer chips as well as sunlit colors of stained glass. Embedded within Matrix are lines of poetry and quotations submitted by the public. The intricate visual patterns reflect how written language has evolved through human history as coded information, from abstract patterns and symbols to digital code. Weber’s documentation took place in 1997 & 2001. The Focus On The Masters archive has extensive information about this artist.